The traceability of our hides is a major strength. Understanding how the animal was treated prior to us receiving the hide is as important to us as the process of leather making itself. Once it has been tanned and converted to leather and is fit for its end purpose we will package it up for distribution around the world. However, what is a hide and how many different sections of the hide are used? A hide is the whole skin from a cow. For some customers, a fully finished leather is required whereas for some only a part processed leather is wanted. In both cases, the leather can be further worked or finished at the J & E Sedgwick plant to finally become a usable leather material or product. A leather craftsman can then create the unique product that will hold its own in the leather market because of the international reputation J & E Sedgwick has made for itself, which starts from its most basic form as a quality hide. 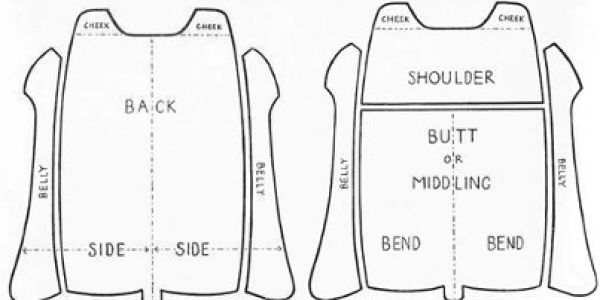 To explain further here are some diagrams which will give you a better insight into the sections of a hide and the divisions between the various sections of leather created. 1) By the square foot or square metre to the nearest full piece. The actual size is determined by measuring devices at the tannery which are regularly calibrated. 2) By the kilo. The actual weight is determined by weighing devices at the tannery which are regularly calibrated. 3) By the piece or pair of pieces, for example, a pair of bends or pair of bellies. Leathers sold this way have one price regardless of the size of piece or pair of pieces. 4) By the bag and kilogrammes, for example, segregated and unsegregated off-cuts.